I'm really loving Bruno Mars' debut album, "Doo-Wops and Hooligans" right now! His single "Just the Way You Are" has spent so much time on repeat in my office that everyone must think I'm crazy for listening to the same song for an hour. Now, I finally got the entire album, and I'm just as into the rest of it. 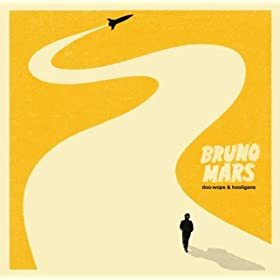 In case you've never heard of Bruno Mars, I can guarantee you've heard some of the songs he's co-written: "Billionaire" by Travie McCoy, "Right Round" by Flo Rida, and "F$&# You!" by Cee Lo Green. Two of his songs were covered in the latest Glee episode, "Just the Way You Are" and "Marry You." He has a light, pop sound that is something I just can't get enough of these days. The songs just make me happy. You can tell he has a wide variety of influences, like R&B, reggae, and soul, so it brings more depth to the songs. "Count on Me" sounds like a track Jason Mraz would sing, and "The Lazy Song" reminds me of Jack Johnson. I have a feeling if you like these artists, you'll enjoy this album.